I haven’t written in a while. The reason is because we just did a cross-country move, from Baltimore to Portland, OR. I’ve dragged the family with me (again) to pursue my Montessori training – this time for 3-6 years old – at the Montessori mecca of Portland. We are completely enamored with this city so, hopefully, this will be our last move in a while. When we first arrived in early March, instead of living in a hotel, we decided to do a short-term rental. We ended up in a beautiful, four-story loft with 15-ft ceilings. The rental featured designer furniture like an L-shaped white leather couch, teak coffee table and Herman Miller chair. It also had a complete, top-of-the-line kitchen with an island and bar stools. It came straight out of a home decor magazine. And we were miserable there. I’d forgotten how hard it is to live in a home designed for adults. Our furniture did not arrive with us, so we had to live with the design of the home as is. Everything was high-up, so B and M couldn’t reach anything. About five times a day, we had to hold them up to the sinks, press their 35-pound bodies into the cold marble and wash their hands for them as quickly as possible (with huge protests, of course). At every meal, we had to lift them up onto the bar stool and then help them get off. 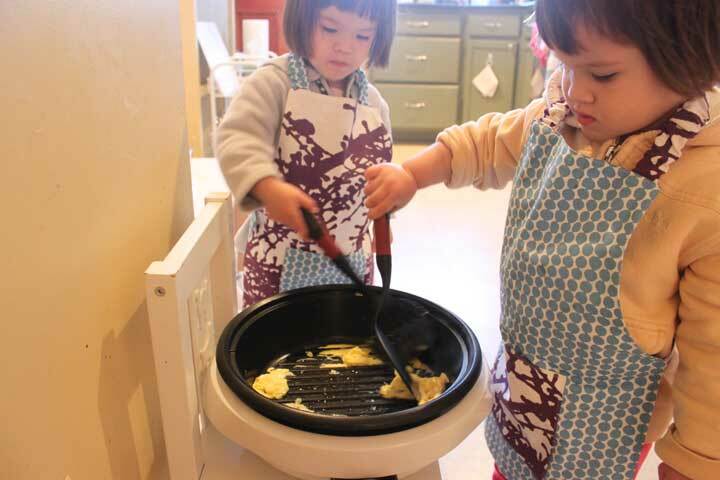 And they started crying at my feet while I cooked dinner – that was behavior I hadn’t seen since we bought the Learning Tower 15 months ago! Even the beds were too high up for them to reach, so we had to help them get on when they came running into our room in the middle of the night (this always happens when we are in new environments). I couldn’t wait to move out of that modern, luxurious hell. Two weeks after we arrived, we moved into a more permanent home up in the Sylvan Heights area of Portland. Our home is nestled in the woods, but just 5 minutes away from downtown Portland! We were so happy when our POD arrived. The girls’ eyes lit up as we started to unload their furniture. They couldn’t wait to sit in their little slatted chairs, help put toys on their shelves and climb on the Learning Tower. When we finally set up their work/play space, we all breathed a sigh of relief. They could sit down and work again. They could find their things again. They could clean up and put things back again. They could wash their own hands again. They can finally eat, sleep, play, bathe and go to the bathroom by themselves again. We were all so happy! If you have children and you’re still living in a home designed for adults, it’s time to think again. From 18 months and up, children should be able to reach everything they need independently. If you’re like me, your sanity – and lower back – will experience a huge difference. Now that our home is set-up, we are ready to take on anything! So bring on the new adventures, Portland! 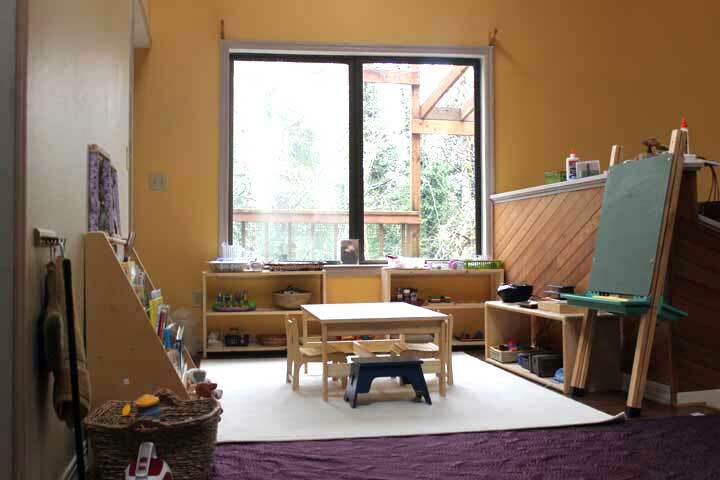 How DO You Create The Best Home Environment for Your Child? Because I know my clients also read my blog, if you sent me an email, I sincerely want to thank you for your kind words and taking the time to write what you did. Now can I tell you the best part about all this? It’s my own experience of certainty and joy. I am more certain than ever that the best home environment is one of the most important things you can do for your child. Parents spend so much hard-earned money on daycare, swim class, nannies and all sorts of products at Toys R Us (I’m guilty as charaged). But home is where your child spends the most amount of time. A child can go into the kitchen 20 times a day. How do you set-up a kitchen so that your child can feel ownership and work on his organizational skills? Does he have a way to access a towel or tissue to wipe his face? Can he reach the bread and peanut butter to make himself a snack? Can he get a drink of water without asking for help? We want an environment where the child can take care of his own needs based on his own timeline and according to his own rhythm. Lucky for us, when he is taking care of his own basic needs, he’s also working on those critical skills we most want him to have: self-discipline, organization, gross and fine motor skills, self-confidence and executive skills. Why buy him a toy to exercise these things, when he can learn it from setting his own table everyday? So, how do you do this? 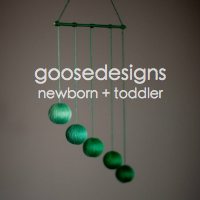 How can you create this for your child, too? After my morning consultation session, I came downstairs and proclaimed to my husband: “I love my job!” I get to work with the most well-intentioned parents whose love for their children move me everyday. 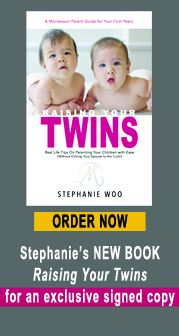 Parents are just looking for some advice, tips and methods that work. The Montessori Method works. Other methods may work as well, but now that you’re here, you need look no further. For more information, please visit my Private Consultation page. 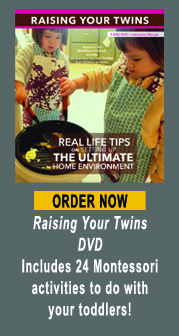 Together, let’s create the best home environment for your child to learn and grow. 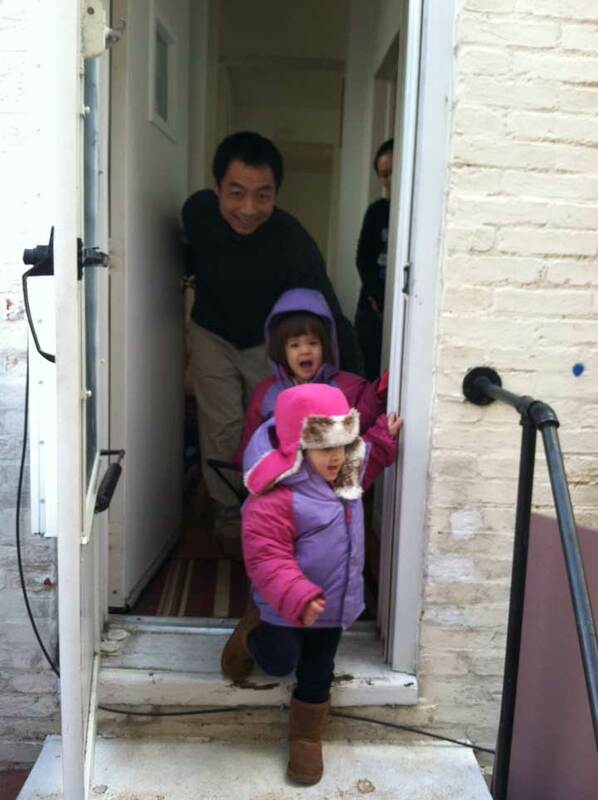 For the last 6 months, B and M have been attending the Federal Hill Montessori School here in Baltimore. Their guide, Man Fai, and I did our AMI 0-3 training together at The Montessori Institute. The amount of work we had to do in order to graduate was extremely intense (the six albums I created during my training totaled almost 2000 pages). It’s a life-changing experience that creates a tight bond between all the participants. Knowing the kind of rigorous training Man Fai went through, I knew my children were in good hands. B and M attend school Monday through Friday, from 830-1130am. For me, the schedule is just right. Three hours per day is the perfect amount of time to spend outside of the home at their age – they started at 20 months – and 5 days a week gives them enough consistency. One thing particularly appealing about the school for our family is that it is a bilingual school, where the guide speaks English and the assistant speaks Mandarin. We will be leaving Baltimore at the end of this month. Looking back, I feel Man Fai was an excellent guide for my children. Even though I’m trained, I can still get lazy at home. For example, I never taught them how to use mats while doing work on the floor. Well, one day, M took out a floor mat, unrolled it, worked on it, rolled it back up by herself and then put it away. Whoa! Things like that don’t just happen by accident. I know she was taught well at school. They also do activities at school that I haven’t thought of or haven’t created for our home environment. For example, one night last month, M ate dinner at the record speed of 3 minutes. She then spent the next 20 minutes scrubbing down the table and chairs with a scouring sponge. From the way she was scrubbing the sides of the table, I knew Man Fai had shown her the table-washing activity, something I haven’t put together at home. 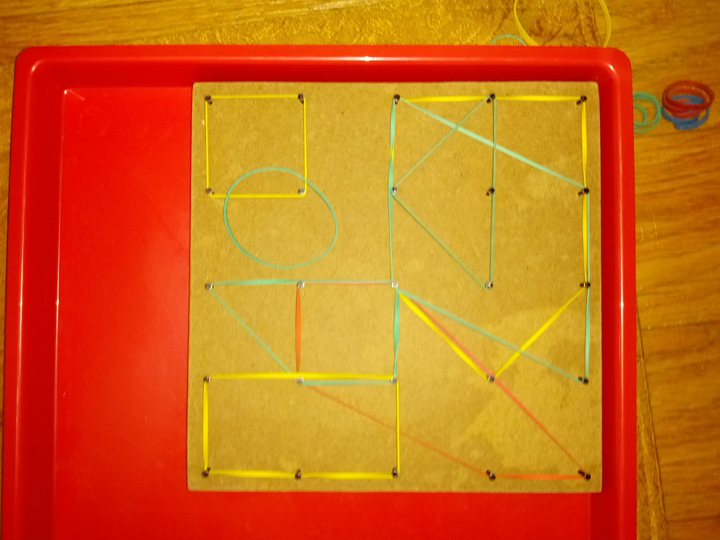 Also, a couple weeks ago, Man Fai sent me this picture of Brooke’s rubber band art creation. As Man Fai wrote, “The board was clear when she got it, and this is the way it was when she walked away.” I love the parent communication I get from this school. In case you’re looking for a Montessori school for your child, look first to see if there is an AMI-certified school in your area. You can do a search here: http://www.amiusa.org/school-locator-2/ If there isn’t an AMI-certified school, ask if the guide (there are no ‘teachers’ in a Montessori classroom, only ‘guides’ – a job title that says it all) is AMI-trained. AMI training is the most rigorous and comprehensive Montessori training available, started by Maria Montessori herself. Start there and you can always shoot me an email if you have any other questions regarding Montessori schools for your child. If you live in the Baltimore area, I definitely recommend Man Fai’s school. Thank you, Man Fai, for a great six months. We are going to miss you and your school very much!